© 2005 Diario de León. Used by permission. I want to believe that every man returns sometimes, at some moment in his life, to the exact point where he was conceived and his essence of unique and special being had its origin. It could be then a journey about gratitude and memories. About cuttings of personal experiences, about the need to return to the roots, although at the time of our age, these roots get mixed up and intermingle, and our home, our town and our father...spread out in multiple homelands and experiences that have taken us far, far away. When this happens, it is not hard to elevate a thorough praise of gratitude. Just then we understand that one person seek for the warmth of a shared mature wine in order to drown in it the emotion of the reunion. One single gesture was enough, one solitary and anonymous visit, for an entire place to have felt what being a main protagonist is like, beyond what its monotonous and everyday life implies. 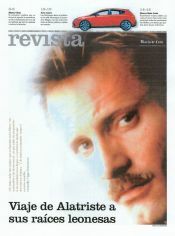 Viggo Mortensen, Aragorn from Lord of the Rings, the most universal hero in Hollywood film-making, had wanted to give all the regions of El Curueño and La Mediana a present, bringing these lands the origin of the film character of "Alatriste", which started shooting in Madrid, on March 7th. Some people might say this is just a gesture in order to make sense of a fiction. But sometimes one gesture, although coming from fiction, has strength enough to spark off a series of reactions, with vast consequences, not only for the one who provoke them but also for the one who perceives them. the North is his only aim. La Mata, Valdepiélago, Montuerto, Nocedo are falling behind... And at one point in the road that leads to Valdorria he stops for a moment, hesitating whether to go up, and he keeps on. The storm gets worse and he wants to arrive Redipuertas as soon as possible and, if it is possible to Vegarada. But he cannot go further the Km 17 the snow blocks the way. "I have also chosen this area -- he comments us in perfect Spanish, barely with an accent -- because, in a way, it reminded me of the spots of my childhood, the snow, the cold, the blurred colours. But it was risky. For a moment, when I was in Lugeros, I thought I couldn't come back, for the storm was getting worse and worse and the snow made the road impassable. So I made a detour to Valdeteja. It's one of the villages I liked the most in that area. When I arrived there for the first time nobody recognized me; the next time was different" the actor smiles, with a gesture of resignation but also of indulgence." On Saturday 26 (February) he returns to Valdeteja at about 16:30. He stops to lunch at Bar Anabel, which was closed in his first visit the week before. On that occasion, he just came across a local man, whom he asked where he could have some salad. The man answered with surprise: "It's not the season for that", and he left. Now it is Gabi, the restaurant owner, who receives him. Viggo orders the salad. Gabi, not recognizing him, looks at him in surprise. He tells Viggo it's not the season for lettuces nor tomatoes, asking him whether he would like some local food. Mortensen, smiling, agrees and orders a nip of orujo (spanish liquor), while placing a packet of Ducados (spanish cigarettes, black tobacco, quite strong) and a tape recorder on the bar. The recorder was on while they were talking. Like Strider, he listens and observes. "He asked me if the recording of the conversation would bother me --Gabi points out-- After saying it wouldn't he began to ask about the differences between the language from León capital city and the one from that mountainous place. He kept taking an interest in our customs, inhabitants, and if this was a busy place with vacationers and fishermen. While I was answering him, I served him a big dish with cured meat, chorizo (kind of pork sausage) and ham, which he hardly ate (no wonder he's too thin!). Then, my 17 years old daughter came and told me: ' Dad, do you know who is the guy in the bar? ', 'No idea' I told her, 'He is Viggo Mortensen, the star of Lord of the Rings!'. I went to him and asked him. He said he was and told me he was researching into the way of speaking of the people, because he was going to start filming a movie about an adventurer of the XVII century called Alatriste, whose roots were in that place of León. At this stage of the conversation, the tavern began to be more and more crowded, and some of those who were coming in recognized him and asked him for autographs while taking pictures with him. Mortensen invited them to eat from his own dish-- he told it was too much for him-- and was talking to some of them. Then he told me he was going to leave for 45 minutes, but that he would come back. He took his car and went to Vegarada. 45 minutes later he came back and told me--Gabi keeps narrating-- that he could only get to Km 17 of the road, beyond Redipuertas, for he feared the storm would block the way when returning. We were talking a bit more, despite I didn't want to tire him with questions that could bother him. Then he told me: 'First of all we are people and we should communicate. Everybody tries to do his job the best one can. So the fact that I am an actor and you are a tavern keeper doesn't imply that each one of us in our jobs stop being a person in order to become something we actually are not, however much fame or luck had favoured us. Ask me what you want, because I'll do the same with you'. We kept talking few minutes more. Then he took his keys, his cigarettes and left, not without thanking everybody for being so kind to him". On Sunday 6:30 a.m. the intrepid Mortensen takes the way North and returns to Redipuertas, where he stays until 9:00 a.m. We met him at 11:00 a.m. in the old monastery of San Marcos, in the capital city. He doesn't object to a few minutes of easy talk, although time is running out for him to return to Madrid. Then he allows to take photographs of him on San Marcos bridge, staring at the snow-capped summits of the Curueño, he says goodbye and leaves. But before I arrive home my mobile phone rang, and I heard Viggo's soft voice from the other side apologizing for not having time enough for a more extensive chat. That single detail defines him as an unpretentious person, far away from those celluloid stereotypes who only care about their image, and never think about those who are near them. I seize the opportunity to make him some of the questions that had remained in my memory and, without being in a hurry, he answers calmly. "As I've already told you--he says-- one of the reasons I came to these places was to hear people's way of speaking, to perfect my accent; that's why I was recording everything they said, and I asked them the same things again and again, in order to hear the correct pronunciation. The truth is they were very kind people and weren't bothered at all,' he points out. The most fascinating thing about talking to Mortensen is listening to the voice and thoughts of a noble and intelligent person that doesn't think he's a star and breaks any pre-established idea that one can have of him. With sense of humour and a great dose of patience he suggests me to emphasize that to come to these lands was his own decision. "I have always thought--he points out-- that the character of Alatriste, though a fictional one, needed to have a place of origin where to link his personality, so I decided that that place could be the highlands of El Curueño, those lands where the cold hardens one's character and people are succinct in manner, like Alatriste, but they are noble and natural when you can get to know them slowly. Pérez-Reverte told me that the Captain of Los Tercios de Flandes, as he had conceived him, was similar in character to the Northern people, and after studying the character carefully, I firmly believe I could place him in any of the Curueño lands. As I always do, I try to get information about places I visit, which can help me to enrich the character I play. I read everything that fell into my hands about La Mediana, El Curueño, and even El Bierzo. During the first week I was in León I went to Compludo and its surroundings, and I could have a full view of all the northern and northwestern part of the province. I think this is the best way of getting into in the role (under the character's skin), knowing his roots, his environment, how the places where he grew are, how their houses are, what they eat, how the people live and speak. Without these premises you can never bring a character to life with credibility". "There are so many good bookstores in León!" For an inveterate fisherman as Viggo Mortensen is, the Hoces del Curueño have a powerful enough appeal for him to go upstream, looking for the most propitious places where to fly-fish once the trout season start in March. Nothing better for that than being up to date, not only on the strategic places but also on the most suitable baits. The reputation of the "drowned fly" of the Curueño came to the actor's notice, and without delay he began an exhaustive search among the bookstores of León in order to buy some printed materials to dispel his doubts. "What I noticed most -- he tells us -- was the large number of good bookstores this city has, and during these weeks I had the chance of checking almost everyone of them to buy some books about that place, to know the customs, gastronomy, surroundings, the game and the fishing, and I was surprised by the richness they contain". We got ample news about that literary route Viggo is used to, for it's commonplace for him, in any city he visits, and in L.A. in particular, to check thrift bookstores and do readings of his own poems, as it took place recently in the city of the movies. The star of Lord of the Rings not only did buy books like "La Real Encartación del Curueño" by Ángel Fierro (guy from León), "La Mancomunidad del Curueño" (The Community of El Curueño) by Mari Carmen Orejas Díez, or "Enciclopedia de las moscas secas/ahogadas para la pesca" (Encyclopedia of dry/drowned flies for fishing) by Tomás Gil, but also took an interest in other topics that are close to him, like poetry. It is well known that Mortensen is an excellent poet with some books published, achieving a good name among English language writers; Therefore, from Benedetti to our Andrés Trapiello, including Silvia Zayas, Jodorowsky or Charo Ruano, these writers were chosen to stuff, even more, his full traveler doublet, and to quench his inveterate reader thirst. In the evening, with the first snowflakes swaying over the road, he can be seen walking alone at the Cathedral square, imbibing a local wine at a city center restaurant named after some painter, or walking down La Rúa, perhaps looking for some old bookstore where to have a quick look at some old copy by the Count of Rebolledo, a XVII c. poet from León who, like Alatriste, served in the Tercios of Flandes, and spent 10 years of his life as Spanish Ambassador in the land where Mortensen played to become a man: Denmark. To seek, to find, to transform, something Viggo Mortensen as a genuine humanist perfectly knows. Not in vain, he easily masters the craft of the rhymed word, of photography, painting, composition. A Government and Spanish Literature graduate, Mortensen is an avid reader, especially of poetry, who can read perfectly in seven languages (English, Danish, Spanish, Swedish, Norwegian, Italian and French). His nomadic and restless soul has lead him to become integrated into the most different and needy ethnic groups, from the vast plains where the Native Americans inhabit to the most urgent problems that take place in any country in the world, as in Argentina, or the ruthless war against Iraq, which he hasn't hesitated to criticize harshly, because of the brutal massacre that people are being subjected to by the Bush Administration. His boundless interest in every human issue, in any thing that can make a man's life a little more bearable, makes him a very approachable person, and not a screen star who is here today because he had to, or because the production company had asked him for it in order to better promote his last film. Nothing of the kind. Viggo Mortensen is one of those few people who doesn't hesitate whether to stop his car or not when passing through an interesting place, or in order to see a friend, or to help anyone in need. " If you are in New Zealand -- he says -- and you are filming a movie, and you drive your car, and you pass through an interesting place and say ' well, I have to come back one day to see it'. NO. You should stop your car at that moment and see it now, although you are a bit late to work, because maybe you are not going to have another chance to see it. As human beings we think so much of 'we'll do it later' , or ' I'll call you tomorrow', 'I'll visit you another day', ' I'll read this book next year'. But maybe you don't read it. Maybe you are not interested in reading it the next year. Maybe you are dead ". At the end of the 90's Dennis Hopper, Viggo's close friend and confidant, begins to take an interest in the creative facet of his fellow actor. Hopper, who as well as being an actor he's a recognized photographer, examines the snapshots his friend has taken since his years at University. Seeing the value and potential of the work, Hopper doesn't hesitate to help his colleague to make it known to the world. After meticulous arrangements and entitled "Errant Vine", the Robert Mann Gallery in NY holds the actor's first photography exhibition. The convincing success he obtained pushes him into getting involved in another similar project at Track 16 Gallery in Santa Mónica. The multimedia paintings that the actor had been working on in his spare time for the last years were shown in public for the first time with the title "Recent Forgeries". The fusion of the actor's paintings, photographs or poems was unanimously recognized as one of the most brilliant and innovatory in century-ending New York. Critics were on his side and the public that went there exalted him as a total artist. Almost one decade after having published his first book of poems, "Ten Last Night" (1993) Viggo took his experience at Track 16 as a starting point to compose his second work, entitled like the exhibition "Recent Forgeries" (1998). This volume (with a prologue by Dennis Hopper) contains some of his poems, paintings and numerous photographs taken by the author, and it was praised by Time magazine when it was published. In 2002 he published "Coincidence of Memory", a compilation of his work from 1978 to that year (the cover is a beautiful snapshot of El Retiro, the most famous park in Madrid), and "SignLanguage", a diary of photographs and paintings made in New Zealand between 1999 and 2001, during the shooting of LOTR. "The horse is Good" contains the photographs he took during the shooting of Hidalgo. Father of a 17 years old boy, Henry, whom he is very close, and who encouraged him to accept his star role as Aragorn in the already classic LOTR, his charisma and generosity amaze his closest friends and filming mates. Being so fond of horses he bought Brego and Hasufel after shooting the famous trilogy, and T.J., one of the horses that played Hidalgo in the homonymous film. His most praised gesture was the one he had to the stunt horsewoman who stood in for Liv Tyler (Arwen) in LOTR, when he gave her the splendid stallion they used during the shooting, for she couldn't bid for the horse due to its high price. Viggo Mortensen's vital course starts in Manhattan, New York, in October 20th 1958. With a Danish father (Viggo P. Mortensen) and an American mother (Grace), he is the eldest of three siblings (all males). When he was two years old, his parents moved to Argentina, and later to Venezuela and Denmark (where his grandparents had a farm). During his stay in the Latin American countries he became a football fan, and a supporter of the Argentinean team San Lorenzo. After his parents split up in 1969, he goes back to the United States with his mother and brothers. Once they settled in Watertown, the kids kept in touch with their father despite the constant trips he had to make while he went from one job to another. As a result of that liberal and cool character of the head of the family, Viggo would inherit the passion for adventure and travel from his father. At High School Viggo stood out as a member of the tennis team and captain of the swimming team. At the age of 17, on Halloween night, he threw himself on a wire after getting a punch, making for good his upper lip with a suggestive scar. Polite and kind, he explores his shyness by writing poems or hiding behind the lens of a camera that goes with him everywhere, helping him to see the world from many and very different points of view. Actor, musician, photographer, painter and writer, Viggo Mortensen is regarded as a genuine "Renaissance man"; a polyglot and a globe-trotter, he gives shape to all his talent by means of different and varied artistic expressions. In 1980, once he finished his education at Watertown High School and having graduated at St. Lawrence University, he decides to look for adventure and cross the big pond, and he goes to live with his cousins in Denmark. He then starts to earn a living by doing the most diverse jobs: flower seller, waiter or digger driver. Two years later he decides to return to the US and become a good actor. Once in New York he decides to consolidate his aspirations and begins but doing the essential: to take lessons in performing arts. He joins the Warren Robertson's Theatre Workshop, and two years later he is ready to perform plays such as "Romeo and Juliet". His first steps in cinema were hard. He was excited when he got brief parts in important films like "Swing Shift" (1984) or "The Purple Rose of Cairo" (1985), but he bitterly saw how his interventions were cut out in the editing room. He eventually gets to make his big screen debut as an Amish farmer in "Witness" (1985) (in which he had just one line), although his true joy would come thanks to the play "Bent" where his performance was recognized by the Drama League Critic's Awards. 1987 was a very important year in the actor's personal life. Two years after his cinematographic baptism, Viggo signs on "Salvation", a low-budget film where he meets Exene Cervenka, singer of the punk band X, who later would be his wife and mother of his only child, Henry. From the very first moment, the chemistry between the two is more than obvious, shortly turning into a stable relationship that ends up in a wedding. The shyness of both of them and their love for music, poetry and quiet life make them the perfect couple. Fleeing the big city for fame not to be bad for their son's upbringing, the family moves to Idaho. This does nothing but making Viggo's professional things difficult, being obligated to constantly go from one audition to another and to accept any job. Thus, after the notable "Fresh Horses" (1988), he gets his first leading role in the horror film "Prison" (1988). In 1995 he filmed "Gimlet" in Barcelona with Ángela Molina, and two years later he was in Madrid to work in "My Brother's Gun" (1997), Ray Loriga's debut as a director, for he's a writer and a friend of Viggo's since. It's exactly at this time (1996-97) when his marriage with Exene comes to an end. Arranged as a friendly divorce, it doesn't entail a drama for them, nor a trauma for their son Henry, whose custody is shared between the two. Free to live closer to his work, Viggo moves to Los Ángeles, where he rented a house near Venice Beach. The relationship with his ex-wife doesn't worsen but gets better, keeping a friendship that leads them to go on vacation together, with little Henry. As a responsible father, Viggo stays with Henry when Exene is on tour with her band, and on the other hand, Exene lives with Henry when her ex-husband has to stay away from home for a log time. The first studio film in which he stood out as one of the leading roles was "A Perfect Murder" (1998), remake of one of Hitchcock's classics. He would also take part in another remake of The Master of Suspense, "Psycho" (1998), before finding again the critics' favour with "A Walk on the Moon" (1999). "28 Days" (2000) was a wrong move to relax with before the journey of his life: "The Lord of the Rings". Although at the beginning the actor chosen for the role had been the British Stuart Townsend, he left the shooting because of some disagreements with the director (Peter Jackson realized the actor was too young for the role of Aragorn). Viggo was the next on the list. His agent called and asked him whether he wanted to go to New Zealand the next day to shoot the film. His son Henry encourages him and Mortensen felt personally linked with the character, and this is transmitted through the screen. "I'm a Celt and a Scandinavian, so I brought up among the myths Tolkien was inspired by for The Lord of the Rings. It's a part of my inheritance". The actor was attracted by that facet of Aragorn's primary and self-sufficient heroism. "He can survive in the wild, live on her, read her signs and achieve happiness without needing anyone, without relying on anything but his own knowledge". But his literary-artistic vocation doesn't end here. Viggo strongly prefers the mechanisms of music and word fusion. His compositions have been praised in the five continents due to the great emotional power his scores emanate. He has recorded some of his poems on compact disc with live music. The first CD to come out was "One Less Thing To Worry About" (1997), 44 audio tracks he recorded along with his ex-wife Exene, the DJ Bonebrake and Buckethead at the bass and guitar. An inspired second part was launched, "The Other Parade". As an "exploration of meat and meat by products conceived and performed by carnivores and vegetarians for consumption by all" he says, "One Mans Meat"(1999) was born, 33 minutes of music and poems live recorded at Track 16 Gallery on December 1998. He also recorded "Live at Beyond Baroque"(1999), a two disc CD in which Viggo surrounded himself with a lot of his friends to read poems of his own and others. "Don't Tell Me What To Do" was recorded during a broadcast of the radio program 'Man in the Moon', from the Southern California radio, with the collaboration of the Duke McVinnie Band. Hobbits Elijah Wood, Billy Boyd and Dominic Monaghan, besides guitarist Buckethead, have collaborated in "Pandemoniumfromamerica". Viggo also takes part in "The New Yorker Out Loud"(Mercury Records, 1998) and "Dreams of the World"(Dove Audio,1996). El Curueño becomes the center of attention once more. But this time it was not because of its famous trout, nor the beauty of its sickles, not even the surrounding spots; its name is being mentioned even in Peking thanks to the presence of this actor who had wanted to place the origin of the man he's bringing to life right now in these mountains. In order to thank him, the people of Valdeteja, the village that, in his own words, had had a deeper effect on this American bohemian, will give him the title of Honorary Citizen (the literal translation from Spanish is Adopted Son), and in a time to come, he will be given such distinction in a ceremony that the inhabitants will hold at the village. A small gesture for the one who also was kind to them. At the moment, the actor is in Jarama, filming the first scenes for "Alatriste", and we are certain that piece of news had pleased him in a special way. The inhabitants of Valdeteja, besides being grateful to this unpretentious actor, they are very moved for him to have chosen their village, their river and surroundings as the place of origin of the Captain of Los Tercios de Flandes, whom we'll see in Spanish screens at the end of 2006.